This is about virtual reality or something, how badass The Chief is, and buildin' robots. Click [HERE] to Cross Changer! Although I have no connection to super sentai shows, I really enjoyed the discussion. I especially liked the sudden MST3K tangent towards the end. You don't hear a lot of love for the KTMA episodes, but there is gold in them thar hills. I also enjoy the notion (because off my ignorance) that the original Power Rangers were based on a show called JewRanger. Ah, Destroy All Podcasts, you teach me so much. P.S. - Not sure why, but my feed popped up the episode "345B" between this one and 344A. And it was clearly a side one, too (Samurai Champloo with Betty and AK). Glad you liked our discussion! Yeah, I am huge MST3K dork and excited for the upcoming Rifftrax Live for Anaconda. I totally think KTMA is underrated. Haha! 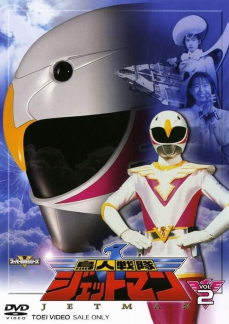 You should probably romanize it as Jyuranger, not Jewranger! Zyuranger is based on weird old outdated romanization that nobody really uses much anymore because it doesn't really convey what it actually sounds like. P.S. Whoops! I accidentally hit publish on a future podcast I was in the middle of preparing. Everything should be correct on it when it's actually published. My bad! I loved this episode! I am a big fan of Power Rangers/Sentai and hearing about this gem from the pre-PR era was great. I actually watched a random episode of Jetman I found on Youtube. It was pretty good, the team fought shadow versions of themselves. The next episode preview showed a caveman episode or some such, which would probably have been a lot of fun to watch too. I bought a bootleg DVD of the USA Network Dynaman a few years ago. It struck me as being more weird than funny, but I have to admit hearing Huey Lewis & The News and Robert Palmer over fight scenes was delightful. May have to watch them again to pay more attention to the jokes which would never be told today. If you are looking to watch some newer Power Rangers stuff, I'd recommend Time Force. Most fans rank it near the top, and it has some really interesting characters and storylines. Another bonus is this series was the last to mainly use models and suits instead of CG, so it looks great. I was surprised you all left Beetleborgs out of your discussion of VR Troopers, etc. It came around a bit later than the initial PR craze but I think it was pretty good. The heroes were younger than in PR, and there were lots more goofy elements, but it had a "comic books come to life" theme that really worked. I am curious to watch some of the B-Fighter stuff it was based on, as I am sure it is quite different. Anyway, thanks for the great episode, let's hear about some more sentai stuff soon! Aside from USA's "Night Flight" (the sort of pre-Adult Swim of it's day I suppose you could say), Dynaman somehow found it's way to Nickelodeon during it's weekend "Special Delivery" block once. Me too. These guys were just starting out, the rules hadn't been set in stone, let alone nailed down like those sets. It has that sort of slightly bewildered quality of very young people just figuring out this concept in criticizing a film in the only way they knew best. "Haha! You should probably romanize it as Jyuranger, not Jewranger! Mr. Haim Saban wouldn't like that one bit! Zyuranger is based on weird old outdated romanization that nobody really uses much anymore because it doesn't really convey what it actually sounds like. I can see why they changed it. Of course when I learned Japanese once in college, we had to pronounce that sound with a "Z" somewhat. I was going to say something over why you've been doing these Side A/B splits in the reviews lately, but I suppose I don't need to know the answer. So the Side A/Side B thing is I am limited by file size. I can't have files larger than 100 MB on CDX. So that means if the show goes over a certain length I either have to cut it in half or make the audio quality really garbage by compressing it to death. We've been talking a lot lately. OOPS. Also re: pronunciation, when I took Japanese in college they did say it was a very slightly "z" noise but really less like a "z "and more like a sort of weakly enunciated "j". ANYWAY Zyuranger makes Americans want to call it "zooranger" which is totally wrong. Though if we're making sense, we should just call it Beastranger. Sort of like the second "G" in "garage". I've seen it written out as "dzh". It's a really good sentai with more emphasis on the human element than others. -The battle between heroes and villians is alot more personal. The lieutenants to the big villian of the series are former friends of the heroes and the story frequently plays on a grudge between them. -The villians (in the form of the main antagonist) are the ones with a mentor figure. The heroes are mostly on their own.